We are promoting, on a volunteer and independent basis, the demand for the abolition of the production and consumption of animal flesh throughout the world; that is to say, the prohibition of products that come from hunting, fishing and farming because they require the exploitation, suffering and death of sentient beings. Join activists throughout the world and hold actions to raise awareness for the abolition of meat! The World Weeks for the Abolition of Meat (WWAMs) are intended as a means of promoting a political debate around the idea of abolishing the production and consumption of sentient beings and other animal products. Worldwide, six million terrestrial animals are killed for food every hour. The number of water animals killed is even higher. Meat consumption causes more suffering and deaths than any other human activity although it is completely unnecessary. Watch the video of the Sept 2012 WWAM event by Animal Rights Cambridge, UK! 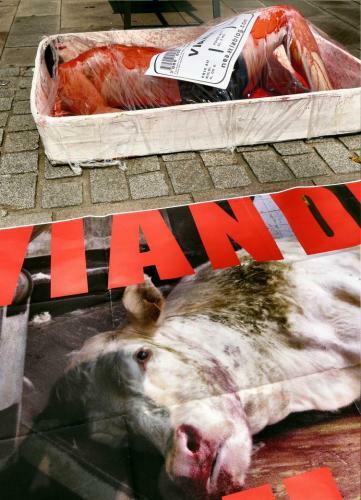 Volunteers: The demand for the abolition of meat needs you! therefore, farming, fishing and hunting, as well as selling and eating animal products, have to be abolished.